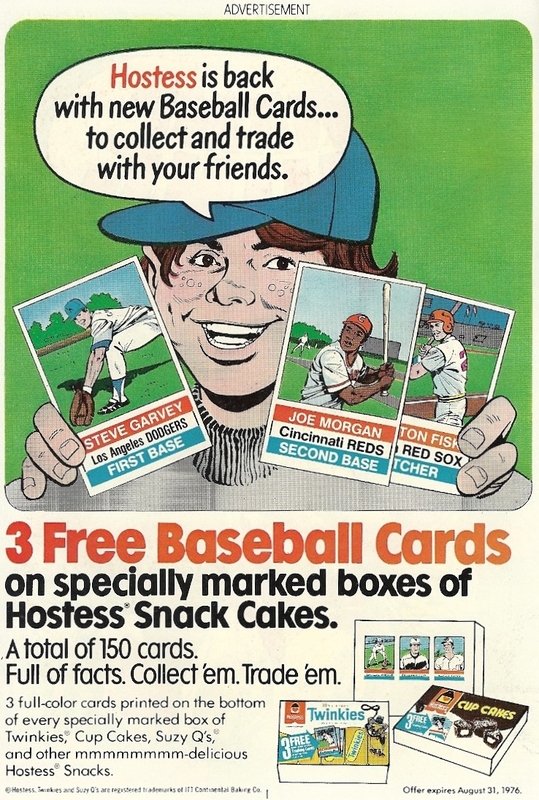 In honor of tonight’s MLB All-Star Game, here’s an ad for Hostess Snack Cakes and their promotional tie-in baseball cards, complete with a befreckled spokeschild who looks vaguely like a certain satirical magazine’s dim-witted mascot. What, me collect and trade with my friends? So let’s get this straight: Not only are Hostess products a part of Superman’s world-saving arsenal, but they also have trading cards printed on the bottom of their boxes? How did humankind ever manage to produce such a magnificent item? I wasn’t yet born when this wave of cards came out, but 150 seems like a hell of a lot for a complete set. If there were three cards per box, then you had to buy fifty — FIFTY — boxes of Hostess cakes to have a complete run. Knowing my card-collecting/loving uncle, who I’ve mentioned here before, he put on a few pounds to get Steve Garvey, Joe Morgan, Carlton Fisk and their ilk.